German musician and writer on musical pedagogics; born at Kottbus May 29, 1836. He first attended the gymnasium in his native city, and later the seminary at Neuzelle. Upon his graduation from that institution he became preacher and religious instructor in the Jewish congregation of Kottbus. In 1863 he removed to Berlin in order to take a four-year course in music at Stern's Conservatory, studying with Jean Vogt and H. Ehrlich (piano), Fl. Geyer, Fr. Kiel (composition), H. Schwantzer (organ), and J. Stern (score-reading and conducting). For eleven years (1868-79) Breslaur was teacher at Prof. Th. Kullak's "Neue Akademie der Tonkunst," his special department being the pedagogics of pianoforte-playing. Shortly after leaving the academy he formed a society among the music-teachers of Berlin, which in 1886 developed into the "Deutscher Musiklehrer-Verband." Breslaur is also the founder and director of a piano-teachers' seminary. A work published by Breslaur in 1874, entitled "Die Technische Grundlage des Klavierspiels," obtained for him the title of professor. In 1883 he was appointed choirmaster of the Reformed Synagogue of Berlin, which position he still (1902) holds. In addition to his contributions as musical critic of the "Spenersche Zeitung" and the "Fremdenblatt," Breslaur has published the following theoretical and pedagogical works: "Die Technische Grundlage der Klavierspiels" (1874); "Führer Durch die Klavierunterrichts-Litteratur"; "Zur Methodischen Uebung des Klavierspiels"; "Der Entwickelnde Unterricht in der Harmonielehre"; "Ueber die Schädlichen Folgen des Unrichtigen Uebens"; "Klavierschule," 3 vols., 18th ed., 1898; a compilation entitled "Methodik des Klavierunterrichts in Einzelsätzen" (1887); "Melodiebildungslehre auf Grundlage des Harmonischen und Rhythmischen Elements" (1896); "Sind Originale Synagogen- und Volksmelodien bei den Juden Geschichtlich Nachweisbar" (Breitkopf and Härtel)—a pamphlet devoted to the discussion of the melodies of the Jewish liturgy. 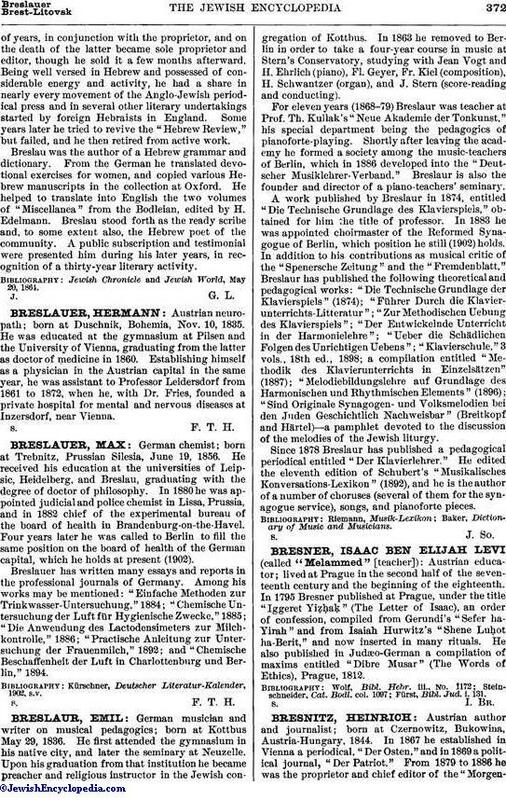 Since 1878 Breslaur has published a pedagogical periodical entitled "Der Klavierlehrer." He edited the eleventh edition of Schubert's "Musikalisches Konversations-Lexikon" (1892), and he is the author of a number of choruses (several of them for the synagogue service), songs, and pianoforte pieces. Baker, Dictionary of Music and Musicians.